They look good nice to have different ones. I see you have kept them in pots Pcw. Are you planning to show them in the future? I planted my ones in those baskets you get for ponds. The whole thing can be lifted and placed in a show pot. They seem to be doing rather well but will take time to bulk up enough to show them. Hi,SG. no,they are a bit early for me.I don't want to put them in the garden where they will get jumbled up with everything else,as they are Brian's named varieties. I am planning on putting them in pond baskets and keeping them all together in a single trough.I have some more,very healthy but no flowers. 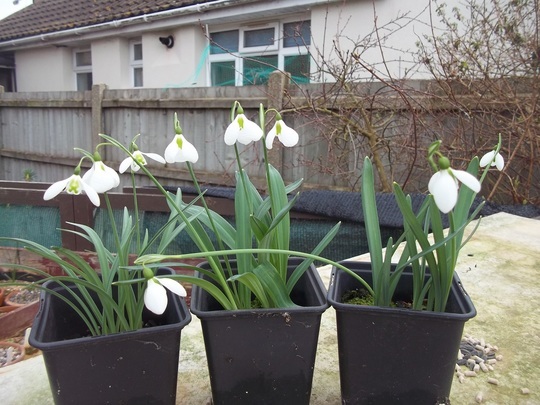 I planted my ones at least two feet apart in the garden but I do wonder if putting them all together in a trough will encourage them to produce a new snowdrop. It will be exciting if that happens. I managed to get some photographs yesterday but not downloaded them yet.